With an ever increasing demand for audio visual appliances in office, hospitality & educational environments, OE Electrics offers an array of connectors and cabling to suit your needs. Our desktop and underdesk modular units accept most audio visual connectors, including VGA, HDMI, DVI, DisplayPort, stereo & mono jack, Phono (RCA) and XLR. The choice of audio visual connectors is always expanding, so please contact us if you have any other requirements. 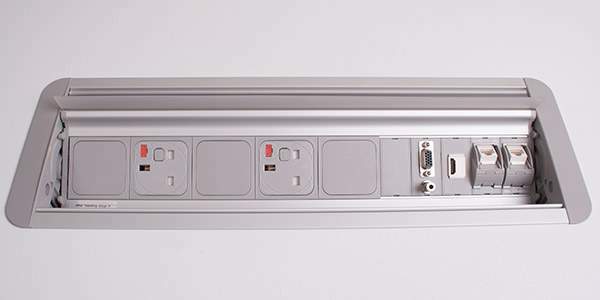 By using a specially designed separator, OE Electrics can supply a power module that also contains data, telecommunications and audio visual connectors all in the same unit, providing an easy and effective method of power and data distribution, combining economy of space with multipurpose effectiveness. HDMI (High-Definition Multimedia Interface) is the industry-leading technology and de-facto standard connecting high-definition (HD) equipment, from HDTVs and personal computers to cameras, camcorders, tablets, Blu-ray players, gaming consoles, smart phones, and just about any other device capable of sending or receiving an HD signal. By delivering crystal-clear, all-digital audio and video via a single cable, HDMI technology dramatically simplifies cabling and helps provide consumers with the highest-quality HD experience. It transmits all HDTV standards and supports 8-channel, 192kHz, uncompressed digital audio and all currently-available compressed formats, with bandwidth to spare to accommodate future enhancements and requirements. What type of cable does OE Electrics use? 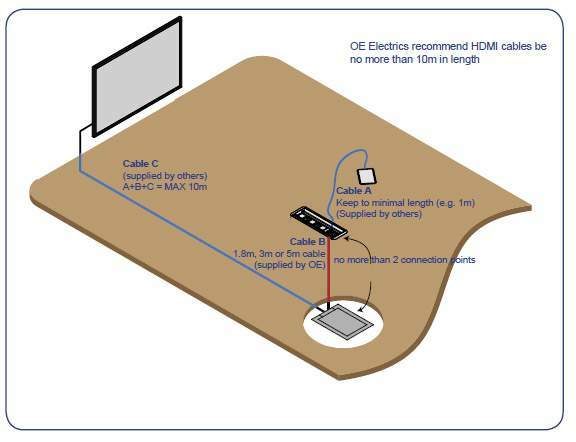 At OE Electrics, we only use High Speed (or “category 2”) HDMI cables which have been tested to perform at speeds of 340Mhz or up to 10.2Gbps, which is the highest bandwidth demanded by HDMI 1.4 and can successfully handle 1080p signals including those at increased colour depths and/or increased refresh rates from the Source. High-Speed cables are also able to accommodate higher resolution displays, such as WQXGA cinema monitors (resolution of 2560 x 1600). Our assembly meets all the requirements of the HDMI ‘High Speed with Ethernet’ specification and also has individually screened data pairs with all 19 pins connected. This is a very subjective question, as it is not only the cable that factors into how long a cable can successfully carry an HDMI signal, the chipsets inside the source or the screen also plays a major factor and it isn’t possible to guarantee that any given combination of cables and equipment will perform adequately. Having performed substantial tests using our cable connected in a variety of scenarios, we have concluded that the majority of equipment will perform correctly with a total length of cable from source to screen of no more than 10 Metres, with no more than 2 joins or couplers. Why is this more restricted than VGA? 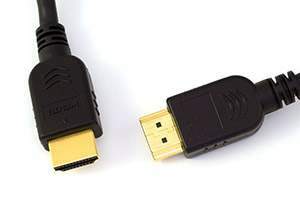 HDMI signals, just like VGA signals, are not designed to travel down long lengths of cable because the signals suffer too much electrical noise. However, unlike analogue VGA signals, which simply produce fuzzy pictures when they suffer from noise, HDMI signals are digital and once the signals are sufficiently poor the receiver effectively gives up and simply doesn’t recognise any signal at all. Effectively, digital signals either get received enough to be reconstituted digitally and produce a picture or they suffer so much noise that the signal cannot be reconstituted and there is simply no picture at all – ie: ON or OFF with no in-between. What length of HDMI cable can OE Electrics Supply? Due to the potential issues as described above, OE Electrics will only supply cables in 1.8m, 3m and 5m to allow for the length of other cables within the installation. Should you require a longer cable we can supply an HDMI extension which connects to the end of the standard cable via a coupler. This solution allows you to separate the cable at the coupler and install a repeater should you require it (see below). We would recommend the consultation of an AV specialist should you require an unusually long HDMI cable. An HDMI Repeater extends the length of any HDMI cable by regenerating the HDMI signal before it outputs to the HDMI monitor or projector. Some HDMI Repeaters will clean out the digital noise (sparkles) in your picture, although a budget one may actually amplify any existing interference present, leading to picture and/ or sound problems. There are also ‘active’ HDMI cables on the market that have a repeater built in, but please be aware that some types of repeater will require an external power supply. OE Electrics does not, at this time, recommend any particular manufacturer of HDMI repeaters as it can be dependent on many factors such as the source or screen used and the cable length required. An AV consultant familiar with the whole project would be in the best position to make a recommendation. For very long runs (over 50M), it would be worth looking at an HDMI to Ethernet converter or even an HDMI to Fibre Optic converter. USB stands for Universal Serial Bus and was developed in the early 1990’s as a means of connecting computer peripherals together in a unified and simple way. What is the maximum cable length for USB 2.0 Data? USB 2.0 provides for a industry recognised maximum cable length of 5 meters for devices running at Hi Speed (480 Mbit/s). This is because data has to be sent and received within a specified time limit but all devices and cables on the USB network cause delays. The longer the cable, the bigger the delay, so 5m is a safe maximum length to avoid loss of data. 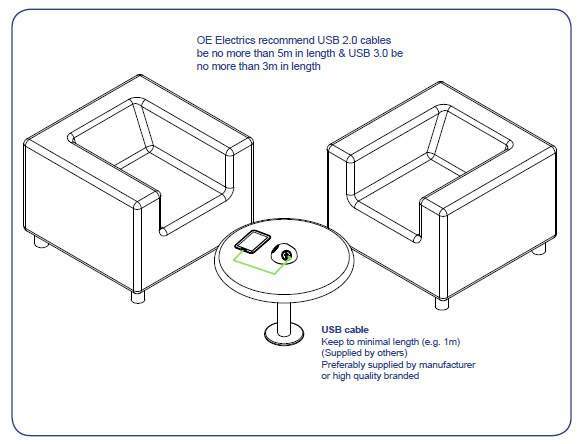 OE Electrics supplies cables for USB 2.0 at either 1.8m or 5m, which are designed to go straight into the back of a PC. The connecting lead from the device to our unit should be kept as short as possible to minimise any signal losses. Can I use a signal booster? There are various signal boosters on the market that allow you to extend the typical range, most of which are in-line and take their power from the 5V provided by USB. Some manufacturers claim cable runs of over 50m, although in our experience, we would not recommend over 10m. Please call or email us if you require anything over 5m and we will advise accordingly. What is the maximum cable length for USB 3.0 Data? The USB 3.0 (sometimes referred to as Superspeed USB) standard does not directly specify a maximum cable length, requiring only that all cables meet an electrical specification: for copper cabling with AWG 26 wires the maximum practical length is 3 meters (9.8 ft). 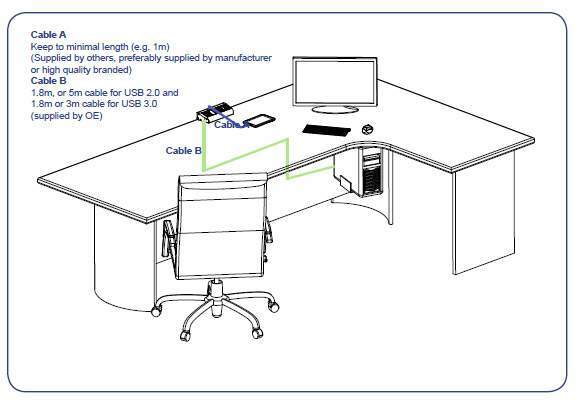 OE Electrics supplies cables for USB 3.0 at either 1.8m or 3m, which are designed to go straight into the back of a PC. The connecting lead from the device to our unit should be kept as short as possible to minimise any signal losses. Is USB 3.0 backwards compatible with USB 2.0? Due to USB 2.0 being so universally popular, a crucial pillar of the USB 3.0 specification addresses how the Superspeed 3.0 standard must remain compatible with the millions of existing USB computers and devices in the marketplace. Essentially, all USB 2.0 devices will work on USB 3.0 hardware, and (nearly) all USB 3.0 devices will work on USB 2.0 hardware. 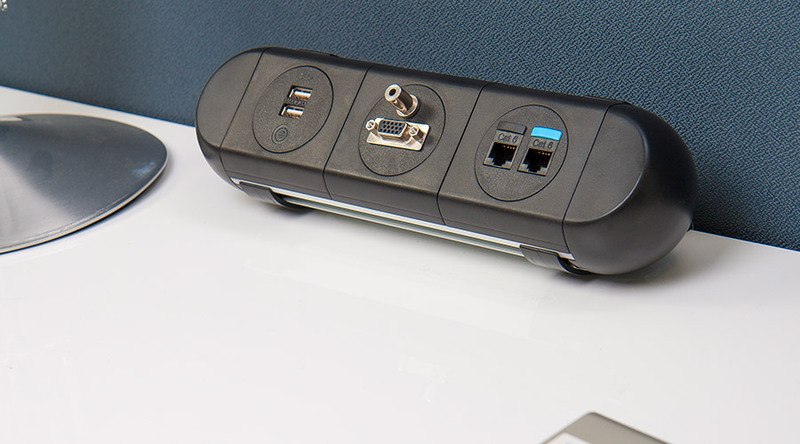 Also, as part of the requirement, all USB 3.0 ports include the necessary pins to process USB 2.0 signals, and all of the receptacles are physically compatible with their earlier counterparts. What is the maximum cable length for USB charging only? OE Electrics has developed our own USB TUF (Twin USB Fast charger) which detects which device is plugged into it and automatically selects the optimum charging conditions in order to provide the maximum current for fast charging. Essentially, each device from different manufacturers speaks a different language. 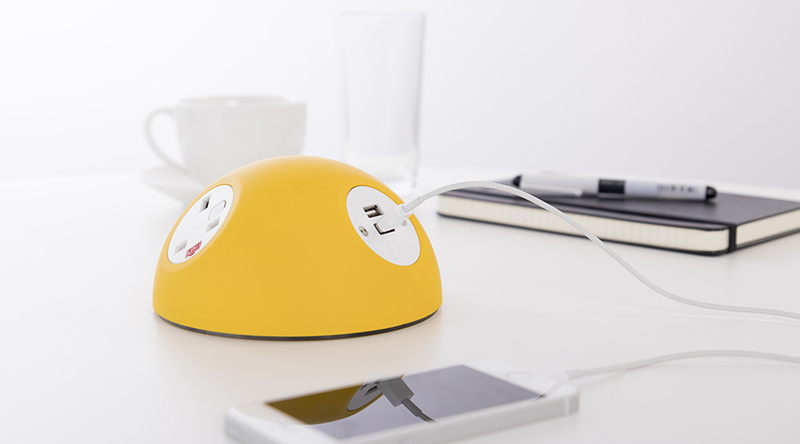 Unlike most USB chargers on the market, our USB TUF is multi-lingual and is able to ‘talk’ to each device in its own language. This can, however be affected by either using the wrong charging cable, or one that is too long. The safest solution is to always use the cable that came with the device, or failing that, a high-quality branded replacement of no more than 1.5m. It should be noted that it is irrelevant whether USB 2.0 or 3.0 is used for charging, as only the power connections are used, which is 5V across all standards. How long can a VGA cable be? It was originally designed for very short runs of a metre or so to connect a PC to a screen, but due the evolution of computer technology, the most common use is to connect a laptop to a screen in a typical boardroom or meeting room. This has presented a challenge for AV companies as well as Soft Wiring specialists like ourselves at OE Electrics. As a result, we have had our own VGA cable made to exacting specifications and can supply at either 1.8m, 3m or 5m lengths. We recommend a total cable length of source to screen of no more than 7.5m. This includes the cable used to connect the source to our unit. What can affect the image quality? There are two factors that greatly affect the image quality. One is the VGA driver or display card inside the computer. Many are designed to drive over short distances and do not perform well above 5-10m. The other is the cable itself. VGA is a hi-resolution video signal and demands a properly designed cable, such as the one, we at OE Electrics have specifically made for us. 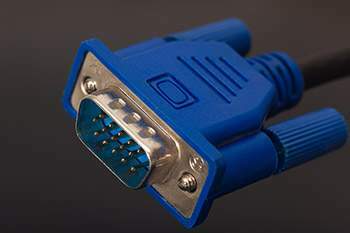 Each of the signal cores inside the VGA cable is individually screened to prevent signal degradation, and the VGA connector pins are gold plated for improved contact. What if I need more than 7.5m? 1. VGA booster/amplifier. This would be a unit fitted in-line with the VGA cable, some manufactures claim a run of up to 70m can be achieved. Some boosters can take their power from the VGA cable itself, others will need an external power supply, a provision for which would have to made for under the desk. 2. VGA to Ethernet adaptor. VGA over IP (Internet Protocol) gives, in theory, an unlimited cable run if routed through a main server room. 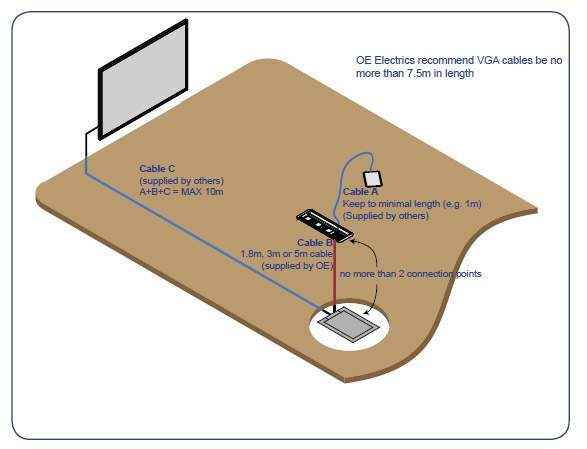 A small converter box, usually powered by the VGA circuit, is needed at each end of the cable run to encode and decode the signal which is transmitted along standard data cable such as Cat5e. This can be a very useful way of sending the signal around the building if you wanted to use multiple screens or even for digital signage on the front of a building or in the reception area.